Open Applications and expand the Cisco folder. 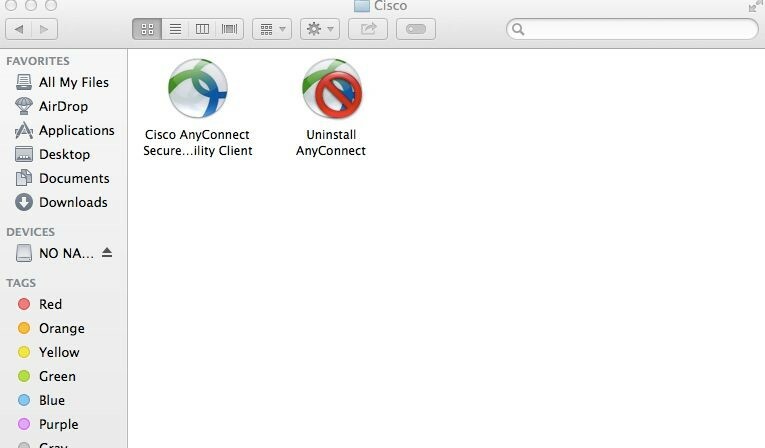 Open the Cisco AnyConnect Client. Enter "ravpn.udayton.edu" in the server field and click "Connect". A six-digit DUO passcode: Enter a passcode generated with your DUO Mobile app, sent to you via SMS or generated by your hardware token. The word "push": This tells DUO to push a login request to the Duo Mobile app installed on your iOS, Android, or Windows Phone device. The word "phone": This tells DUO to authenticate via phone callback. The word "sms": This tells DUO to text you a batch of passcodes. You can then retry login using the passcode option above. Even if you’re not enrolled in 2FA, you must enter something in the “second password” field to log into the VPN. We suggest something simple, like the character ”1”, but any character(s) will suffice. When you're successfully connected to the VPN, you'll see the message below. NOTE: If your office computer is a Mac, contact your IT Support Unit to learn about options for remote connection. In Windows 8.x, select “Settings” from the bottom right-hand corner of the screen. Select “PC info”. In Windows 7, from the Start menu, select “Control Panel” (or “Settings”, then “Control Panel). Select the “System” settings. In Windows 8.x and 7, select the settings for remote access. Under the heading "Remote Desktop", select an option to allow connections from other computers. Use the “Select Users” settings to allow access by particular users. Typically, all administrators of the computer will have access by default. Click “OK” to save your settings. Your computer will now be able to accept incoming Remote Desktop connections. You'll also need your computer's IP address to locate it from home. Use these directions for finding your computer's IP address. Be sure to leave your office computer powered on if you plan to connect from home. In the Computer box, type the name of the Windows-based computer that you want to connect to, and then click “Connect”. Type your user name, password, and domain for the Windows-based computer if they are required. Click "Disconnect" to end your VPN session.